Released in cinemas in 1982, Creepshow is typically regarded as a minor entry in both the film output of George A. Romero and the history of adaptations of the works of Stephen King. Yet this lack of critical attention hides the fact that Creepshow is the only full collaboration between America’s bestselling author of horror tales and one of the masters of modern American horror cinema. 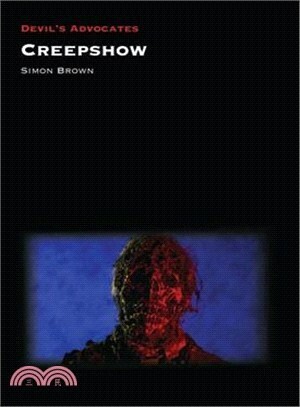 Long considered too mainstream for the director of Dawn of the Dead (1978), too comic for the author that gave audiences the film versions of Carrie (1976) and The Shining (1980), and too violent for a cinemagoing public turning away from gore cinema in the autumn of 1982, Creepshow is here reassessed by Simon Brown, who examines the making and release of the film and its legacy through a comic book adaptation and two sequels. His analysis focuses on the key influences on the film, not just Romero and King, but also the anthology horrors of Amicus Productions, body horror cinema, and the special make up effects of Tom Savini, the relationship between horror and humor, and most notably the tradition of EC horror comics of the 1950s, from which the film draws both its thematic preoccupations and its visual style. Ultimately the book argues that not only is Creepshow a major work in the canons of Romero and King, but also that it represents a significant example of the portmanteau horror film, of the blending of horror and comedy, and finally, decades before the career of Zack Snyder (Watchmen, Man of Steel), of attempting to recreate a comic book aesthetic on the big screen. Simon Brown is associate professor of film and television at Kingston University. A lifelong Constant Reader, he has published numerous articles on Stephen King adaptations, including pieces on Under the Dome, Cell, and Salem’s Lot. His most recent work is the monograph Screening Stephen King: Adaptation and Horror Genre in Film and Television (2018).